This pineapple dream pie recipe really takes me back. My grandma used to make a similar pineapple dessert recipe and I can remember it being one of my all time favorite sweet treats. I’m so happy that I’ve had the chance to perfect this pineapple dream pie recipe over the years because it’s really special and incredibly delicious. When I close my eyes and picture my grandmother’s kitchen the way it was when I was a small child, my senses are flooded. I can smell cornbread baking in the oven, I can hear her using a fork to whisk, and egg and I can see evening light bouncing off the curves of her Pyrex glassware. Pyrex has been an icon in kitchens everywhere years. In fact, this American-made classic is celebrating a really incredible birthday right now—100 years! While so much has changed in the world in 100 years, some things have stayed the same. 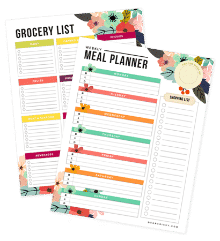 Pyrex continues to hold it’s place in the kitchens and hearts of home cooks across this country, and I’ll be continuing the tradition by sharing my Pyrex prepware, bakeware, serveware and storage products with my own children. I’ve been reminiscing about my childhood a lot lately, and as I mentioned, I recently landed on a memory of this wonderful pineapple dessert that my grandma used to make. 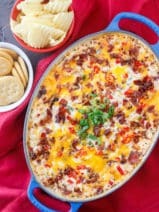 Unfortunately, the recipe was lost to our family, but after a bit of digging online, I found a similar recipe that I was able to tweak a bit to make it more like my grandma’s recipe. There is something special about this pie. We always called it a pineapple dream pie, and it’s true—it tastes like a dream. I decided to mix it up a little and use a vanilla wafer crust instead of a graham cracker crust for this pineapple dream pie. This was a new endeavor for me, but I have to say that it tastes really wonderful. It was an added treat to be pressing the yummy crust into this gorgeous Pyrex® 100 Easy Grab 9.5″ 100th Anniversary Pie Plate! The 100 year engraving in the bottom of the plate makes it a really nice keepsake as well. The funny thing is, I’m not typically a huge fan of pineapple. I don’t care for the texture, but I do LOVE the flavor. 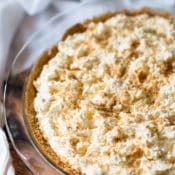 This pineapple dream pie recipe uses 2 cups of crushed pineapple and the pieces are small enough that they just flavor the filling perfectly. When my dad tried a piece of my pineapple dream pie, he said, “This is a pie worth taking to church.” Of course, he means gatherings or special events at the church when my mom usually takes a dish of some sort to contribute. I guess being church-worthy is the mark of a truly delicious dessert. For me, this pineapple dream pie is a little taste of the past. It truly takes me back to being a kid and sitting around the table with my family. I just can’t believe it’s been so long since I had a slice of my grandma’s pineapple dessert. It’s a good reminder to hang on to the good things in life. Whether it’s person, a treasured family recipe or even a tried-and-true brand. Pyrex has released some beautiful 100th-anniversary product lines to celebrate this fantastic milestone! They have a fun, vintage twist and I’m eager to grow my collection. To shop the collection, check out the Pyrex100 website. You can grab the recipe for this truly outstanding pineapple dream pie below. I hope you love it as much as my family does! My pineapple dream pie recipe is sponsored by Pyrex®, a World Kitchen brand. Preheat oven to 350 degrees. Using your food processor, pulse cookies until finely ground. If no food processor, add to 1 gallon plastic bag and roll with rolling pin. Be sure to reserve a few cookies for the top of your pie. Add sugar, salt, and butter to the food processor and pulse until well combined. Firmly press your wafer crumb mixture into bottom and up sides of a 9-inch pie dish. This should give you plenty of crumbs for a nice, thick crust (which I LOVE). Bake until crust is dry and set, about 10-12 minutes. Let cool completely in plate on a wire rack before attempting to fill. Beat the cream cheese and butter together until creamy. Reduce mixer speed and add powdered sugar slowly until well combined. Beat on high speed for one minute. Add a heaping tablespoon of your drained pineapple and stir in. 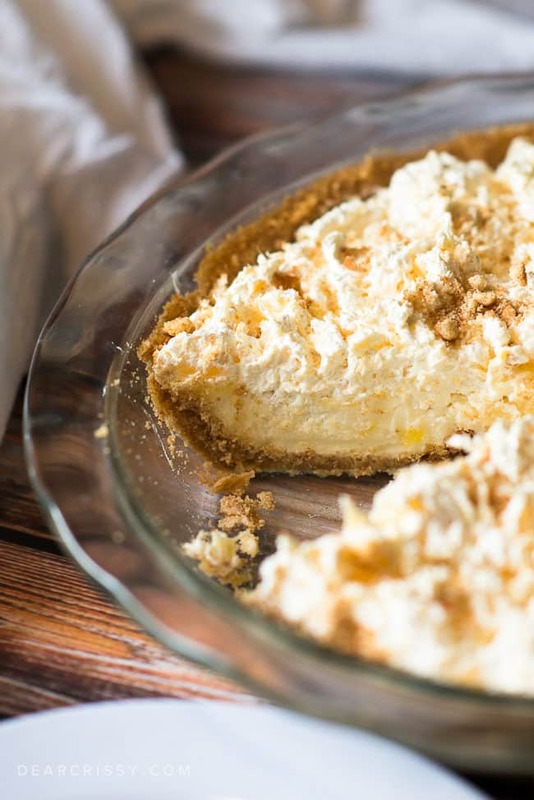 Spread this cream cheese and pineapple mixture over your crust. Fold the remaining pineapple into the whipped topping and spread on top of the cream cheese layer. Crush a few extra vanilla wafers and sprinkle over top of pie for decoration, or decorate with whole vanilla wafers. Refrigerate for at least 4 hours, preferably overnight. 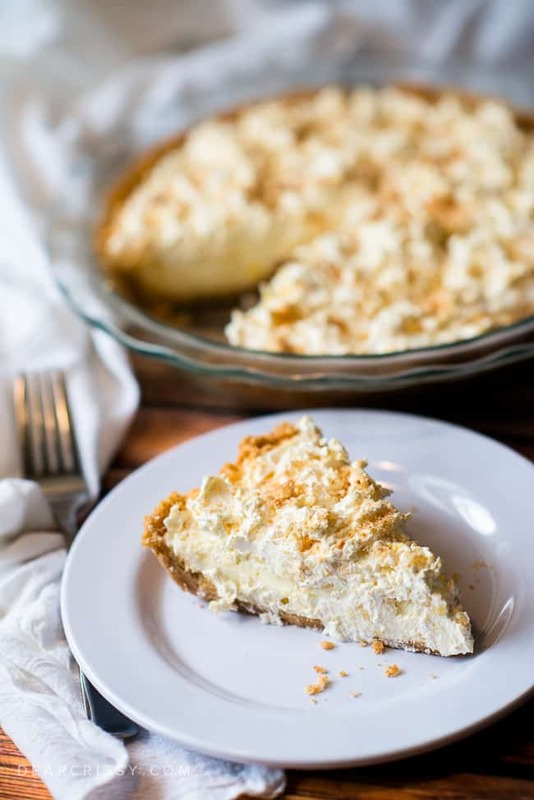 This recipe is adapted from the Pineapple Dream Dessert from Amanda’s Cookin’, which is very close to the recipe I remember having as a kid. Thanks for the great recipe, Amanda! I would like to use this recipe but I don’t want to use whipped topping. can I use heavy whipped cream instead? Have you ever come across a recipe for “pineapple dream dessert” what their the cream cheese? This is very similar to my grandma’s old recipe which I LOVED and has gotten lost over the years, but hers didn’t use cream cheese. Your recipe looks amazing though! I’ll definitely have to try it! And I thoroughly enjoyed reading your introduction, this has always been a very nostalgic dessert for me as well. I think this was called “Dream Pie” because, before Cool Whip, there was a similar product, a powdered product, that you made at home with the electric mixer, called Dream Whip. A tasty variation of this recipe would call for making the rust with ginger snaps instead of vanilla wafers. 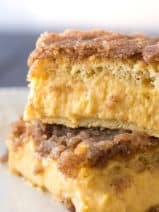 That suggestion for a variant goes for almost any cheesecake recipe – especially a pumpkin cheesecake. Sounds so GOOD. Going to make this for my husband this weekend!!!! What amazes me is that people who can’t find the time to scroll past a 200 word introduction can somehow find the time to complain about the free recipe with which they’ve been provided. 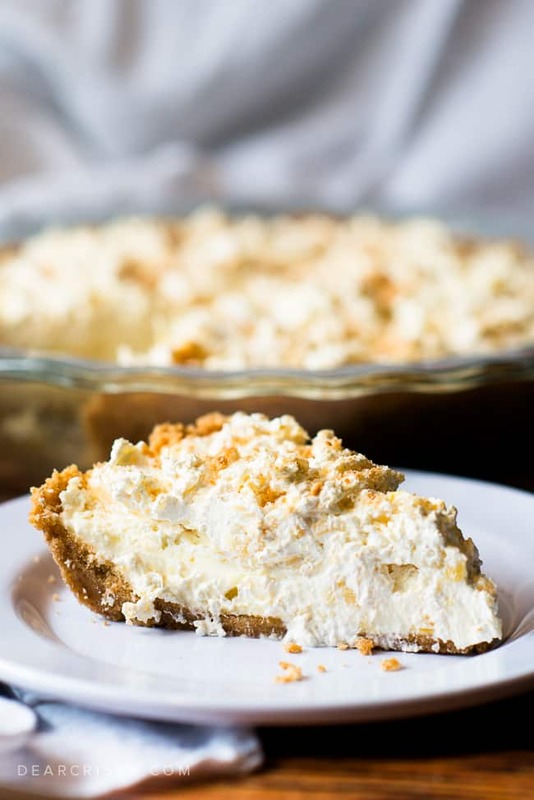 I love the idea of the vanilla wafer crust! A bunch of us that worked together in the ’70’s used to make this. 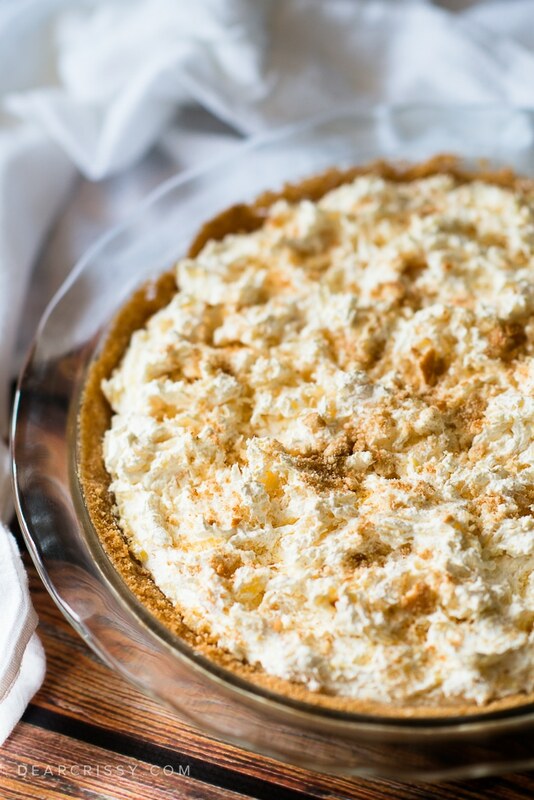 I still have the recipe, but I think its just a tad different, however it is a luscious and refreshing pie especially in the summer. 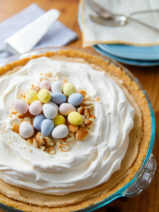 Finely chopped maraschino cherries added to filling makes this pie so delightfully tropical deluxe. I saw the link and picture for your pie on Yahoo’s main page. Delicious! I find whipped topping unappealing so I substituted with fresh whipping cream which is so easy to make and much better. Otherwise, great recipe!! The pie is similar to a pineapple cheesecake my Mom used to make. I have some Pyrex pieces that I got at my wedding shower in 1965! Sadly, Pyrex is not the same as it used to be. My daughter-in-law’s 9 x 13 pan cracked in half, with dinner in it! Her2 cup measure also broke. People are starting to look for old Pyrex at flea markets and estate sales. 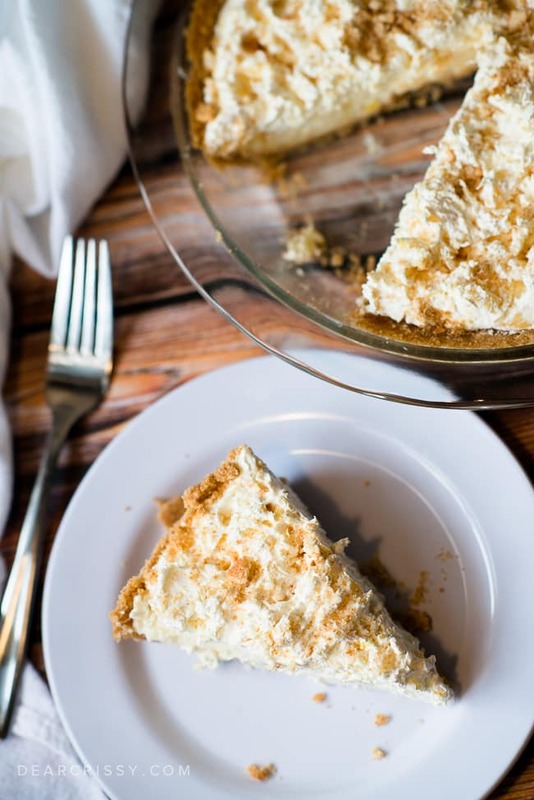 I have made this pie a lot since I’ve gotten it from dearcrissy and my family LOVES this pie and they want it for Thanksgiving especially my daughter Lolli. So thanks for the recipe dearcrissy. 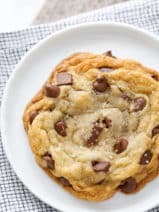 If you substitute gluten free Annie’s cinnamon sugar bunny cookies for the vanilla wafers, the whole pie is gluten free and yummy. I remember my grandma and mom using Pyrex – and it’s the only brand in glassware that I trust in my kitchen. Oh, my aunt used to make this too. We all would go crazy over it. Every now and then I would think about it and wish I would have gotten the recipe from her. Now I have it, thanks! This pie is amazing! I made it today for the first time and I can’t believe i had never tried this delicious pie before! Prep was quick and easy. I did use a premade graham cracker crust for the sake of time because I was in a rush, however. I also froze it for about 1.5 hours (for the sake of time too) and I thought it was the perfect consistency and temperature. Next time I make this I’m going to try it with the vanilla wafers. Thanks for the recipe! I also LOVE pyrex..especially my vintage coveted pieces from my gran. 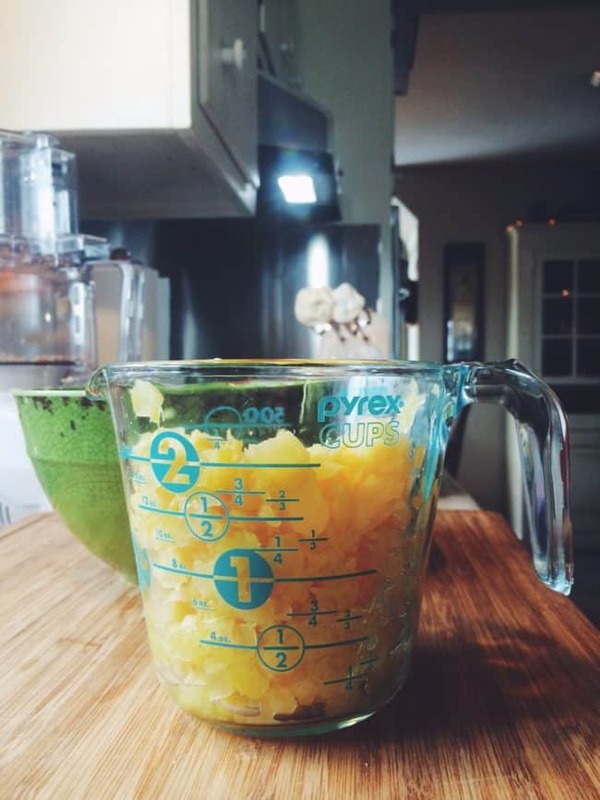 Your recipe looks yummy too..big pineapple fans in our home. 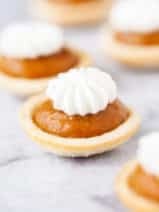 Has anyone ever tried to make this into bars instead of pie? WOW!!! Pineapple pie! Definitely the first I have ever seen! Always a fan of sweet and tart pineapple! I think my husband would really dig this! Pinned! This is the richest, most decadent dessert I’ve ever tasted. My mom made it every Christmas! I LOVE pineapple. This looks delicious. A cook’s kitchen is not complete without a Pyrex item in it. I love pyrex. I have been using it since I started my own home in the seventies.